A home theater, also known as home cinema, is a combination of audio and video components designed to recreate the experience of being in a movie theater in the comfort of your own home. Living in a beautifully designed environment offers people the comfort, luxury, and convenience to enjoy the simplest pleasures of life. Nowadays, people can make the most of their lives even if they only stay at home. To make their homes more relaxing and enjoyable, they can install movie theaters for home entertainment. There’s no better place to enjoy all those action-packed movies, romantic movies, and comedies than at home. However, before building your home theater, make sure you know the different aspects and important factors involved in designing a home theater. First, the complex process of designing a home theater begins with selecting the right equipment that fits your home. The screen size of the television should fit the available space. Large screens are generally suitable for larger rooms, while medium-sized screens are highly recommended for medium and to smaller rooms. After that, it is also very important that consumers evaluate different specifications of products available. Of course, users should also look for specific elements that match their preferences. The efficiency of the equipment is another important aspect to consider in the design of a home theater. With many models available in today’s market, people will find some products that promise more than they can deliver. To avoid this pitfall, you must first analyze and evaluate the different home theater equipment before making purchases for your home theater. Also,it’s always recommend that consumers compare products available to the intended design before choosing. In addition to the obvious aspects and factors that influence home theater design, consumers must also address some of the problems that can seriously affect the total satisfaction they get from home theater systems. Things to consider are the types of cables needed, the distance between the seats and the screens, and the best possible positions for the surround-sound speakers. To make it easier for consumers, home entertainment systems providers, such as Savant, offer special services and product support to all their customers. Nowadays, staying at home and entertaining one’s family is becoming more desirable and having a home theater is the one of the way. Here are some benefits of having your own home theater. You get the same cinematic experience without the hassle.There is no need to leave the comfort of your home. You’re able to enjoy whatever food or drink desired. No more waiting in lines. You can take your video games to a new level.In a dedicated home theater, the video games experience to taken to a whole new level. Video games have become more immersive, with larger-than-life, clear images and realistic surround sound. Whether you’re a Guitar Hero or you’re on the front line of Call of Duty, playing video games on a home theater is a different experience – you’ll never want to go back! Front row tickets to any event.Your home theater takes your Monday Night Football, March Madness, or Winter Olympics viewing party to the next level. Giving you and your guests the “almost live” experiences. Complete control.You will never miss any scene when you leave the room. You have complete control to stop, rewind, or fast forward. It’s up to you. Incredible sound and acoustics.Since the acoustics is an essential part of the movie experience, when designing your home theater you should consider the shape of the room, the location of the furniture and the decoration contribute to the overall sound in a room. 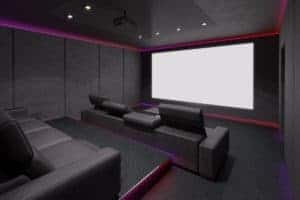 Any room can accommodate a home theater.Any room can be turned into home theater but whichever room is chosen it should be have soundproof walls, and minimal not no windows to control the light coming into the room. Incorporating technology.Incorporating technology with your home theater can assist in home automation and entertainment. Integrating your digital advances and applications such as your smart home controls is easy to do. Increase the value of your home.According to a New York Times article, a well-designed and installed home theater can increase the value of your home. Hosting viewing parties with home theaters.Your home theater will become the favorite place for friends to meet and watch movies or game. Your children can invite friends to movie nights within the security of your home. It can create unforgettable memories with your family. Your home will become the perfect place to gather to watch movies and sports events. The home theater design will add to the overall enjoyment of the viewing experience. In addition to the design the equipment purchased will enhance the experience. Always consider the size of the room, the furnishing, and decor when designing your home theater. Even though home theaters are consider a luxury only found in luxurious and extravagant houses, it’s possible to design an affordable home theater for any budget. PrevPreviousMotorized Window Blinds and Shades are the Answer! Motorized Window Blinds and Shades are the Answer!